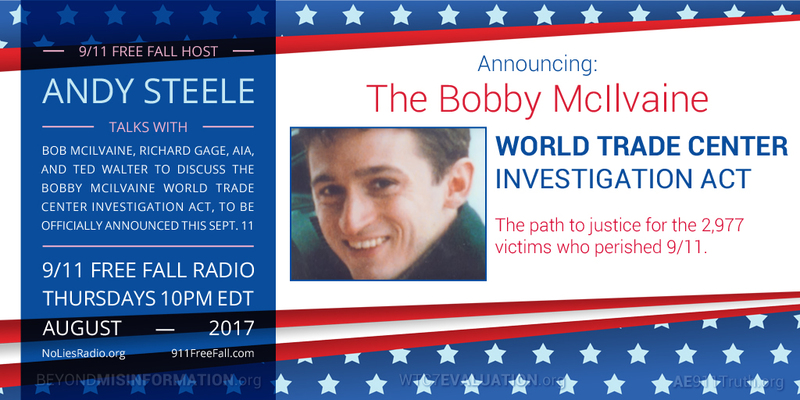 In this special episode of 9/11 Free Fall, Bob McIlvaine, Richard Gage, AIA, and Ted Walter discuss the Bobby McIlvaine World Trade Center Investigation Act, which McIlvaine and Gage will officially announce in a news conference at the National Press Club on September 11th. Host Andy Steele’s three guests tell how AE911Truth will be calling upon its supporters in the coming months to ask their US representatives to introduce the Act to either chamber of Congress. In addition, Ted Walter and Richard Gage announce Professor Leroy Hulsey’s upcoming progress report presentation on his World Trade Center 7 Study, which will be livestreamed from the University of Alaska Fairbanks’ website on September 6th.